Ever since I was around 8 years old, I've been scrapbooking. At first, I'd simply help my sister Miriam as we worked on my book. Gradually, however, I got old enough to do it alone, and began working hard to make a scrapbook of my own. Memories are also made while recording other ones. Some of my favorite times spent with my sisters have been those times we've cropped and created together. It's always more enjoyable to work with others; it's a great time to get advice if you're having trouble with a certain page. Or, we simply talk and laugh together as we remember a certain time captured in one of the photos. Yet, you're probably thinking, how do you find the time? It can be a problem; there's so many things going on, and so many other things one could be doing. However, I still try to find the time, sometimes scheduling evenings to work on it with my sisters. Sometimes it helps to have motivation. 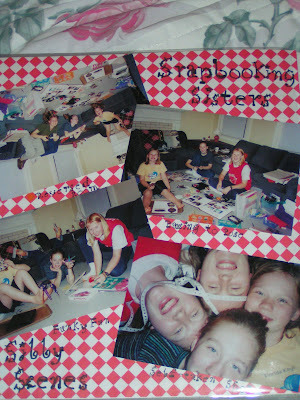 I've been scrapbooking a lot lately, trying to get caught up before the family reunion we're having here this weekend. It's easy to fall behind, for pictures are taken faster than you can scrapbook them. Although I wouldn't trade my digital camera in for anything, there's an added delay with all the digital photos. Now, you have to take the time to sort through them, pick your favorites, and upload them to be printed. However, the time is well worth it. There's something delightful about curling up with a great big scrapbook and paging through it, recalling each even captured in the pictures. The pages come alive, with their creative arrangements and clever (sometimes!) captions. One goes back in time and sees each adventure through new eyes. Many a happy hour I've spent looking through the books time and again. I never seem to tire of them. In addition to journals, scrapbooks are a wonderful way to record the past, and keep glimpses of it preserved for posterity. And, unlike journals, a scrapbook is something that can be shared with all your friends and family. I find great joy in sharing the memories with a friend or family member, and they often find as much enjoyment looking at the engaging pages. They say that "a picture's worth a thousand words." So what better way to share the events of your life with others than through pictures? I look forward to the day I'll get to sit down with my children or future husband and show them glimpses of my girlhood. I've taken and preserved many pictures, and just recently started on my fourth big scrapbook. Yes, you could say that I'm an avid scrapbooker - having four books to record a mere sixteen years of life! I can't help it though; the art is such fun. I find it relaxing to sit down, turn on some beautiful music, and let my mind create as I cut shapes, arrange photos, add comments, and coordinate stickers. It's a truly lovely craft. So what about you? Are there any scrapbookers out there? How do you preserve your memories? It's never too late to start! Anna, you don't know me, but my name is Sarah. I came across your blog a while ago, and when I found out you knew the Mortons, I was really surprised, because I know them as well. 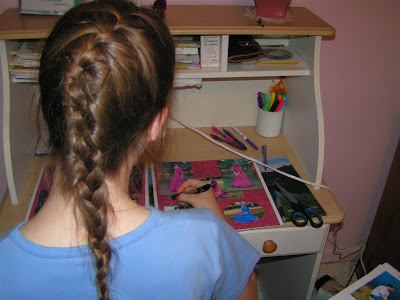 I live in Thomasville GA, and I am also homeschooled(and I love scrapping! )I really like your personality and your heart for God, and I think it would be cool for us to write, or something. I'm fourteen, and I love the Lord, and well, I just wanted to give ya a friendly "hi there!" from South GA! God bless! 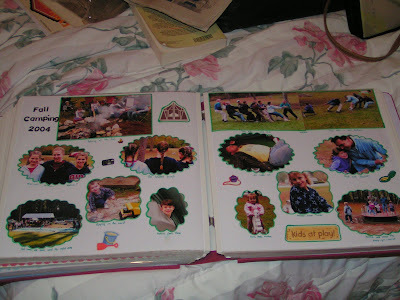 Scrapbooking looks like fun! I haven't tried it yet, though. I've always kept a journal, since I was little, and we do have plenty of photo albums that are nicely arranged. But I definitely want to try scrapbooking sometime too. It is sooo nice to know there are others out there treading the same path! I have been so impressed with you girls' taking the time and energy to scrapbook. It is something I would like to do, even though I am artistically challenged :), but find time to do it scarce with my family! But one day all the pictures I've been collecting may be scrapbooked. I wish I could find time to catch up on mine. I don't think we will have time at the reunion but sometime soon when we visit, we need to scrap! It's FINE if you didn't but did you make Lisa Beth a matching dress to Sara and Danielle's? I was just curious if I need to bring her something specific to wear to the Anniversary Reception. Let me know here or by email. 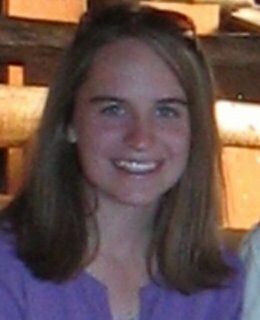 Sarah, welcome to our blog! It's nice to hear from you - and neat that you know the Mortons as well! Anna, yes, scrapbooking is a lot of fun! =) If you ever get the chance, I'd suggest you try it. Michele, yes I can imagine that it's hard to find time to do it at your house. Maybe one day you and Danielle can do it together - I'm sure she'd enjoy it. She was showing me the small scrapbook she had when I was there. Can't wait to see you! Maria, yes, sometime when you're here we need to do it together! I am working on Lisa Beth's dress, and will have it done by the time you come. It's so small and cute! So, that's what she can wear for the anniversary celebration. Stefani, yes I am blessed with a wonderful family, full of many scrapbookers! Mom and I need to sit down and work on ours. I have fallen too far behind, I fear. However, I love looking back at the pages that we have made. It is fun to recall the memories we have made as an individual or as a family. Ooo fun! I used to scrapbook a lot, but then I got a digital camera. Like you said, now the hard part is remembering to print out my pictures! I need to get some new color ink for my printer, because I do have the time now. I just need to do it! Hi Anna! I'm sorry that I always comment on your posts really late but I was wondering...how many pages do your books have? I just started scrapbooking and my current book has 40 pages if you use front and back, but I just use the front so it will be 20 pages for me. Your pages come out so nice, keep up the good work! Katie Marie: I fill my scrapbooks pretty full; I just counted one big one that had 48 pages (96 if you count both sides, which I use). It makes the book really big, but it saves on buying books!